Response to "From the President"
Response to "Whose is Alexander"
While it is true that those people were subdued by Philip II, father of Alexander, in 359 B.C. (Diodorus Siculus 16.4.2), they were never Macedonians and never lived in Macedonia. Indeed, Demosthenes (Olynthian 1.23) tells us that they were "enslaved" by the Macedonian Philip and clearly, therefore, not Macedonians. Isokrates (5.23) makes the same point. Likewise, for example, the Egyptians who were subdued by Alexander may have been ruled by Macedonians, including the famous Cleopatra, but they were never Macedonians themselves, and Egypt was never called Macedonia (and so far as I can tell does not seek that name today). Certainly, as Thucydides (2.99) tells us, the Macedonians had taken over "a narrow strip of Paionia extending along the Axios river from the interior to Pella and the sea". One might therefore understand if the people in the modern republic centered at Skopje called themselves Paionians and claimed as theirs the land described by Thucydides. But why, instead, would the modern people of ancient Paionia try to call themselves Macedonians and their land Macedonia? Mr. Brunwasser (p. 55) touches on the Greek claims "that it implies ambitions over Greek territory" and he notes that "the northern province of Greece is also called Macedonia." Leaving aside the fact that the area of that northern province of modern Greece has been called Macedonia for more than 2,500 years (see, inter alios, Herodotus 5.17; 7.128, et alibi), more recent history shows that the Greek concerns are legitimate. 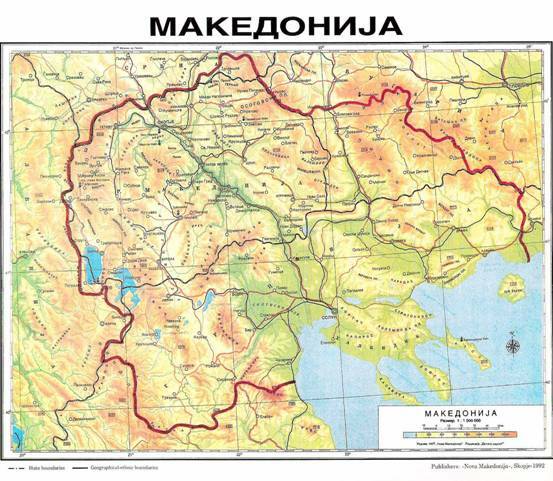 For example, a map produced in Skopje in 1992 shows clearly the claim that Macedonia extends from there to Mt. Olympus in the south; that is, combining the ancient regions of Paionia and Macedonia into a single entity. 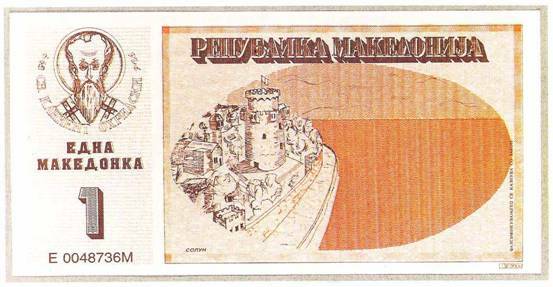 The same claim is explicit on a pseudo-bank note of the Republic of Macedonia which shows, as one of its monuments, the White Tower of Thessalonike, in Greece. There are many more examples of calendars, Christmas cards, bumper-stickers, etc., that all make the same claim. Further, Mr. Brunwasser has reported with approval (International Herald Tribune 10/1/08) the work of the "Macedonian Institute for Strategic Research 16:9", the name of which refers "to Acts 16:9, a verse in the New Testament in which a Macedonian man appears to the Apostle Paul begging him: ‘Come over into Macedonia, and help us.’" But where did Paul go in Macedonia? Neapolis (Kavala), Philippi, Amphipolis, Apollonia, Thessaloniki, and Veroia (Acts 16:11-17:10) all of which are in the historic Macedonia, none in Paionia. What claim is being made by an Institute based in Skopje that names itself for a trip through what was Macedonia in antiquity and what is the northern province of Greece today? I wonder what we would conclude if a certain large island off the southeast coast of the United States started to call itself Florida, and emblazoned its currency with images of Disney World and distributed maps showing the Greater Florida. "The Department [of State] has noted with considerable apprehension increasing propaganda rumors and semi-official statements in favor of an autonomous Macedonia, emanating principally from Bulgaria, but also from Yugoslav Partisan and other sources, with the implication that Greek territory would be included in the projected state. This government considers talk of Macedonian "nation", Macedonian "Fatherland", or Macedonian "national consciousness" to be unjustified demagoguery representing no ethnic nor political reality, and sees in its present revival a possible cloak for aggressive intentions against Greece." Mr. Brunwasser (a resident of Bulgaria), however, goes on to state, with apparent distain, that Greece claims "Alexander III of Macedon (Alexander the Great) . . . as Greek." This attitude mystifies me. What is there to "claim"? Alexander’s great-great-great grandfather, Alexander I, was certified as Greek at Olympia and, in the words of the father of history "I happen to know that [the forefathers of Alexander] are Greek" (Herodotus 5.22). Alexander’s father, Philip, won several equestrian victories at Olympia and Delphi (Plutarch, Alexander 4.9; Moralia 105A), the two most Hellenic of all the sanctuaries in ancient Greece where non-Greeks were not allowed to compete. If Philip was Greek, wasn’t his son also Greek? When Euripides – who died and was buried in Macedonia (Thucydides apud Pal. Anth. 7.45; Pausanias 1.2.2; Diodorus Siculus 13.103) – wrote his play Archelaos in honor of the great-uncle of Alexander, did he write it in Slavic? When he wrote the Bacchai while at the court of Archelaos did he not write it in Greek even as it has survived to us? Or should we imagine that Euripides was a "Macedonian" who wrote in Slavic (at a date when that language is not attested) which was translated into Greek? What was the language of instruction when Aristotle taught Alexander? What language was carried by Alexander with him on his expedition to the East? Why do we have ancient inscriptions in Greek in settlements established by Alexander as far away as Afghanistan, and none in Slavic? Why did Greek become the lingua franca in Alexander’s empire if he was actually a "Macedonian"? Why was the New Testament written in Greek rather than Slavic? 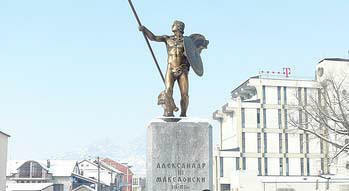 On page 57 of the so-called "Letter from Macedonia" there is a photograph of the author standing "before a bronze statue of Alexander the Great in the city of Prilep." The statue is patently modern, but the question is whether the real historic Alexander could have read the Slavic inscription beneath his feet. Given the known historic posterity of Slavic to Greek, the answer is obvious. While Mr. Brunwasser’s reporting of the archaeological work in Paionia is welcome, his adoption and promotion of the modern political stance of its people about the use of the name Macedonia is not only unwelcome, it is a disservice to the readers of Archaeology who are, I imagine, interested in historic fact. But then, the decision to propagate this historical nonsense by Archaeology – a publication of the Archaeological Institute of America - is a disservice to its own reputation. 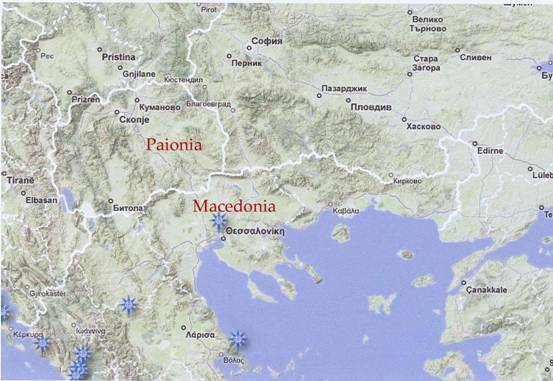 Let it be said once more: the region of ancient Paionia was a part of the Macedonian empire. So were Ephesos and Tyre and Palestine and Memphis and Babylon and Taxila and dozens more. They may thus have become "Macedonian" temporarily, but none was ever "Macedonia". Allow me to end this exegesis by making a suggestion to resolve the question of the modern use of the name "Macedonia." Greece should annex Paionia – that is what Philip II did in 359 B.C. And that would appear to be acceptable to the modern residents of that area since they claim to be Greek by appropriating the name Macedonia and its most famous man. Then the modern people of this new Greek province could work on learning to speak and read and write Greek, hopefully even as well as Alexander did. Click here for the translation in Greek. 200 Classical Scholars from around the world, sent a letter to the President of the United States of America, Barack Obama. an update with 332 signatures was sent. Since then, the list of cosigners has grown to 376, see Addenda. 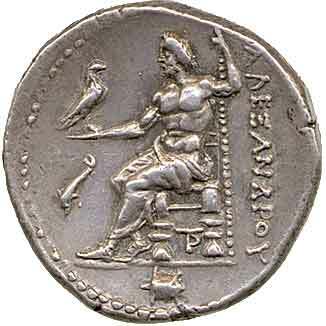 Macedonian coin, stating in Greek: "ΑΛΕΞΑΝΔΡΟΥ"